Ideal for beginners and novice riders up to 12 easy fences. Awards 1st £17, 2nd £14, 3rd £10, 4th £8, rosettes to 6th. Awards 1st £18, 2nd £14, 3rd £10,4th £8, rosettes to 6th. Area 6 will be holding an Eventing League during 2019 for both individuals and branches at PC80, 90, 100 and 110cms Levels. There is no fee or entry form required and all individuals and their respective branches will be automaticallyincluded in the league for entering the below competitions. Standings will be published each month on the new Area 6 Eventing League page on The Area 6 website (http://branches.pcuk.org/area6/). The aim of the league is to encourage Members to compete at all levels of eventing. All League Classes will be run strictly under 2018 Pony Club Eventing Rules. Please note further dates may be added if Area 6 branches announce future ODE’S during 2019, also not all the above dates will feature all 4 height sections at their events. Please check The Pony Club Area 6 website regularly as dates/venues may change due to unforeseen circumstances. Riders must be Members of an Area 6 Branch of The Pony Club. Open to any horse/rider combination at any level. Riders may ride more than one horse at any or the same level as each horse/rider combination will be awarded points separately. Points will be awarded solely to the finishing place within Area 6 entries. For example should an Area 6 Member finish 2nd to a non-Area 6 member, the Area 6 member would receive the points for first place. This will also be the case in mixed sections of Pony Club and Non Pony Club Members. All points will be allocated by the League Manager under the scrutiny of The Area Rep.
At the end of The League Series the winner from each height section will be the horse/rider combination with the most points. In the event of a tie the combination with the greatest points accumulated from The Area Competition Sections will be deemed the winner. The Area Branch League will be determined by the addition of all the points from individuals representing that branch across all four levels, PC80, 90, 100 and 110cms. Further details regarding Awards will be released during the coming months. Our last competition of the year was held on Sunday 26th November 2017, Open Team Showjumping, held at Hill House Equestrian Centre. It was a very cold day but we saw some incredibly good riding through all of the classes, well done everyone. Thank you to all of our helpers, organisers, team managers and our Judge for the day, it was a long one. Thank you to all of our competitors for joining us for the duration, there were some very well turned out horses and riders and you all supported and congratulated one another as the day progressed, we hope you all enjoyed it and took lots of positives from the day, whether that be success or homework to do for next time. Thank you to everyone who attended our Hunter Trial at the weekend, it seemed to be enjoyed by all and over an extended (slightly squishy) course. We seemed to dodge the worst of this weekends weather and the ground held up remarkably well. Our Members had a very productive day, being well in the placings across all classes. Lots of new faces again with lots of returning regulars, we hope to see you all at next years events. We have lots of plans for the course over the off season, so keep your eyes peeled for new things and improvements to existing features. Thank you to all of our volunteers who have helped with preparation and the running of the day itself, without you we could not run our events. Thank you to our Paramedics and First Aiders who continue to make sure we are fit and well and put us back together if things don’t quite go to plan. Thank you to our official photographer, David Neve Photography (http://www.davidnevephotography.co.uk/f960222098) for continued support and beautiful photos of our competitors. Results for our Show Cross Event, 11th June 2017, at Bagmoor Park. A rather large THANK YOU to everyone who attended our Show Cross today. What a lovely day we all had with beautiful weather to top it off. We hope you all enjoyed your visit. Competitors in class 1 seemed to enjoy their super cute small course and gymkhana task. Thank you to all of our volunteers for their time and skills, without your assistance our events simply would not run at all, everyone is a very valued member of our ever growing team, roll on to our next event which is our Autumn Horsewear Ireland National Hunter Trial Series Qualifiers, which will take place on 17th September 2017. Thank you to The Bedshop Superstore, Snowdonia Avenue, Skippingdale Retail park, for sponsoring all of todays rosettes. Thank you to everyone who supported this event, so nice to see the all the regulars return again and again, and this time so many new faces hope to see you again at our future events, hope everyone had a good day and enjoyed themselves over the different course, shame about the wind. If you spot any mistakes in the results please email scunthorpe@pcuk.org to get them amended. 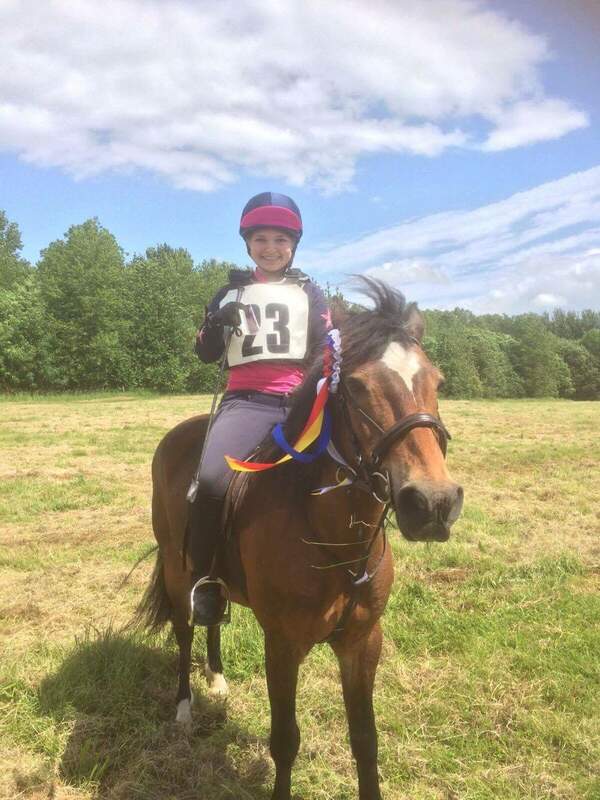 We have teamed up with Horse & Hound to provide online event entry for our events at Scunthorpe and District Branch of the Pony Club . This is through Equo Events which allows you to quickly and easily enter events online via a secure payment system using your laptop, tablet or smartphone, wherever you are. You will also be able to store all your rider and horse details, receive notifications of drawn orders, times and even keep track of your successes through your own rider dashboard as well as being able to view and download invoices and your payment history. 2nd York & Ainsty Pony Club 20 Faults 163.36 seconds. A very good day had by all and a pleasure to Host you all. Some great displays of riding, sportmanship, some firsts and some learning curves. Well done to everyone who took part in the competition. Thank you to all of our helpers, our photographer, Lucy Taylor for all of the organising and our officials for the day. The Scunthorpe & District is a Branch or Area of The Pony Club.